Yesterday Azerbaijan’s central bank gave up its pegged exchange rate regime and floated the Manat. The Manat plummeted immediately and was essentially halved in value in yesterday’s trading. Azerbaijan is not the first oil exporter this year to have given up its fixed exchange rate policy. Kazakhstan did the same thing a couple of months ago and last week South Sudan was forced to devalue by 85%. Angola also earlier this year devalued and Russia has now also given up its attempt to manage the float of the rouble. And Azerbaijan is likely not the last oil exporter to give up maintaining a pegged exchange rate. Given the continued drop in oil prices and the strengthening of the dollar oil exporters with pegged exchange rate (to the dollar) will continue to suffer from currency outflows. Critics of floating exchange rates and of devaluation of the kind the Azerbaijan i central bank undertook yesterday often say that devaluation just will cause higher inflation and any effects on competitiveness will be short-lived and that “internal devaluation” therefore is preferable. Furthermore, these critics argue that for a country like Azerbaijan a devaluation will not help as oil is priced in US dollars anyway and that the countries have little else than oil to export. However, this in my view misses the point completely. 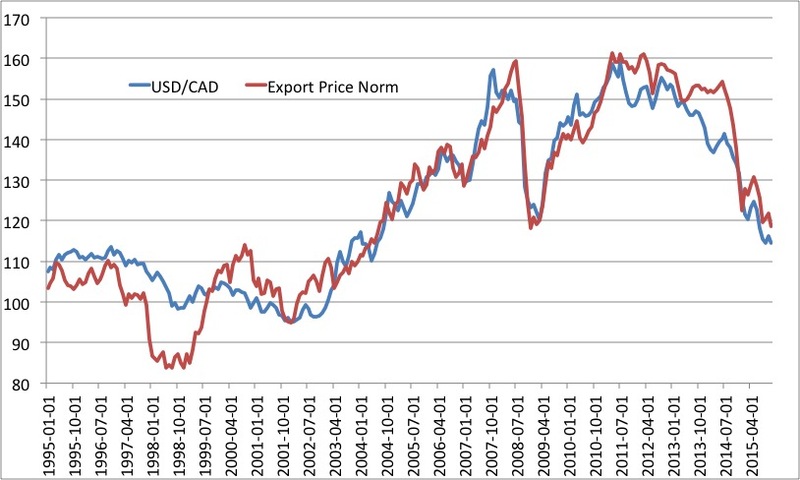 Giving up a fixed exchange rate and floating the currency (or introducing an Export Price Norm) is not about exports and competitiveness. Rather it is about avoiding a collapse in domestic demand and more practically it is about stabilizing government revenues. Hence, for a country like Azerbaijan the majority of government revenues come directly from oil exports – typically directly from a government owned oil company and/or through taxes on oil and gas companies. This means that if oil prices collapse the government revenues will collapse as well. However, a crucial part of this story that is often missed is that the important thing is what happens not to the oil price in US dollar, but the oil price denominated in local currency as the government’s expenditures primarily are in local currency. Hence, a government can keep it’s oil revenue completely stable if the government allows the currency to weaken as much as the drop in oil prices (in US dollars). Therefore, the choice for the government and central bank in Azerbaijan was really not a question about boosting exports. No, it was a question about avoiding public sector insolvency. Of course the Azerbaijani government could also have introduced massive austerity measures to avoid a sovereign default. However, with a pegged exchange rate regime massive fiscal austerity measures would likely be extremely recessionary – and remember here that under a fixed exchange rate the budget multiplier typically will be positive and maybe even larger than one. Hence, under a fixed exchange rate regime fiscal policy is at least in the short-term “keynesian” as there is no monetary offset. Said in a more technical the so-called Sumner Critique do not hold in a fixed exchange rate regime. In that sense we should think of the devaluation in Azerbaijan as a one-off improvement in oil revenues – as oil revenues increases exactly as much as the currency was weakened yesterday. Let me try to illustrate this with an example. Let us first assume a oil-elasticity of 1 for Azerbaijani government revenues – meaning a 1% increase in oil prices increases the nominal revenue by 1% as well. Yesterday USD/AZN jumped from 105 to 155 – so nearly 50%. This of course means that the oil prices denominated in Manat overnight also increases by around 50%. Given government revenues presently are around 27% of GDP this means that a 50% devaluation “automatically” increases government revenues to around 40% of GDP (27 + 50%). Said in another way overnight the budget situation was “improved” by 13% of GDP. If the government alternatively should have found this revenue through tax hikes (or spending cuts) without a devaluation then that would have caused a deep recession in the Azerbaijani economy. In fact if we assume a fiscal multiplier of 1.5 (which I don’t think is unreasonable for a fixed exchange rate economy) then such fiscal tightening could have caused real GDP to drop by as much as 20% relative to what otherwise (now!) would have been the case. Obviously there is no free lunch here and over time inflation will be higher due to the devaluation and to the extent that is allowed to be translated into higher expenditure some of the impact of the devaluation will be eroded. The extreme example of this is Venezuela or Argentina. However, there is one very important difference between the two scenarios – devaluation or fiscal austerity – and that is under a fiscal austerity scenario it would be not only real GDP that would drop, but nominal GDP would likely drop even more. This will not happen in the devaluation scenario where monetary easing exactly means that nominal GDP is kept stable or increases. This means that the debt dynamics will be much more positive than under an “internal devaluation” (fiscal austerity) scenario. What I am arguing here is not discretionary monetary policy changes, but I am trying to explain why so many oil exporters have chosen to float their currencies this year and to illustrate why this is not about exports and competitiveness, but rather about ensuring government revenue stability and therefore avoiding ad hoc fiscal adjustments that potentially could cause a massive economic contraction. So once again – I am not advocating “continues devaluations”, but rather I am advocating automatic currency adjustments to reflect shocks to the oil price within a clearly defined rule-based framework and I therefore also continue to advocate that commodity exporters should not peg their exchange rates against the dollar, but rather either float their currencies and implement a nominal GDP target or implement an Export Price Norm, where the currency is pegged to a basket of currencies and the oil price so the currency “automatically” will adjust to shocks to the oil price. This would stabilize not only government revenues, but also stabilize nominal spending growth and over time also inflation. I recently came across two indices, which are measuring two on the surface unrelated things – property rights and environmental standards across different countries. However, anybody who ever read Ronald Coase would know that according to Coase the best way to manage externalities (read pollution) is to have well-defined property rights. Note I am simplifying Coase’s message a lot here, but nonetheless this is basically at the core of what some have called Free Market Environmentalism. The first index is the International Property Rights Index (IPRI) published by the Property Rights Alliance. The IPRI rank different countries according to the level of protection of property rights. This is what we get when we plot the two indices against each other. So there you go. The one graph version of Free Market Environmentalism – if you are concerned about the environment you should really primarily concern yourself about the protection of property rights…Unfortunately that is unlikely to be on the mind of most of the policy makers who are meeting in Paris these days to discuss global climate change. PS you can find the data here. Update: Some have suggested that this is a spurious correlation caused by the fact that high environmental standards and the level of protection of property rights both are positively correlated with income levels. That is partly right, BUT not fully right. I have tested this by estimating EPI as a function of BOTH property right and GDP/capita. Even doing this property rights comes out as being a (very) significant determinate of environmental standards. A high GDP is not enough – property rights need to be protected as well.